- Title: 'Haut et Bas Rhin, Franconie, Souabe' (map showing the Rhine region in France) Copperplate engraving on verge type hand laid paper with watermark (not visible on every sheet). Recent hand coloring. 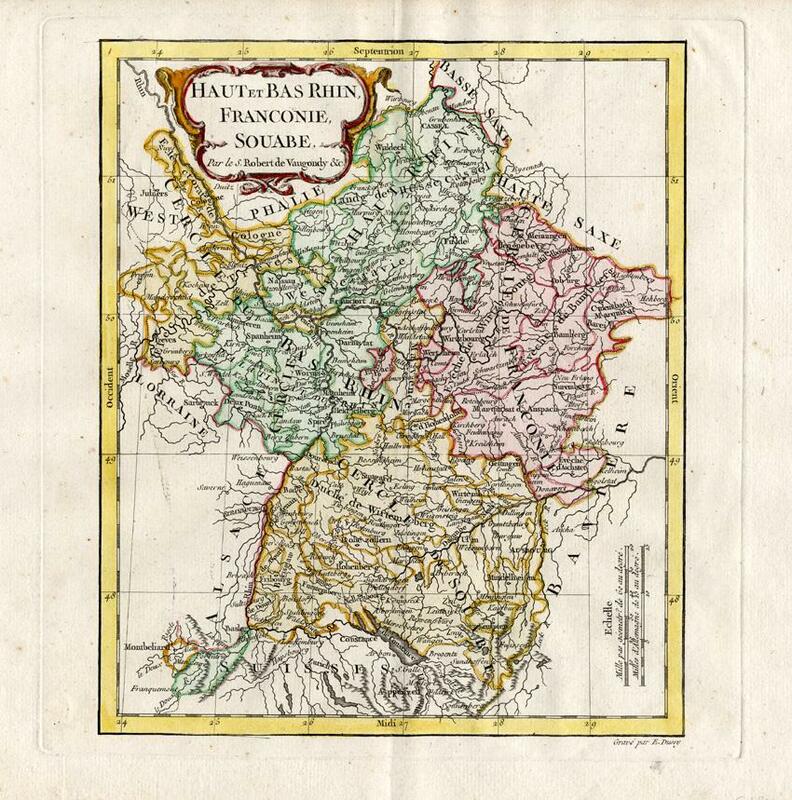 Description: This map originates from: 'Nouvel Atlas Portatif Nouvel Atlas Portatif, destiné principalement pour l'instruction de la jeunesse', pas le S. Robert de Vaugondy Geographe ord du Roi, published in Pairs with Fortin in 1778.Artists and Engravers: Gilles Robert de Vaugondy (1688-1766), also known as Le Sieur or Monsieur Robert, and his son, Didier Robert de Vaugondy (c.1723-1786), were leading mapmakers in France during the 1700s. Condition: Fine. General age related toning and light staining, particularly along the edges of the paper. Print is larger than shown on the scan. Carefully study scan as this shows the map well. Storage location: A71-18 The overall size is ca. 11.4 x 11.4 inch. The image size is ca. 8.1 x 9.4 inch. The overall size is ca. 29 x 29 cm. The image size is ca. 20.5 x 24 cm.